For over 200 years, Door County’s lighthouses have stood as beacons of strength and protection along the peninsula’s shores. Of them all, the one that has always stood out from the rest is the Cana Island Lighthouse. 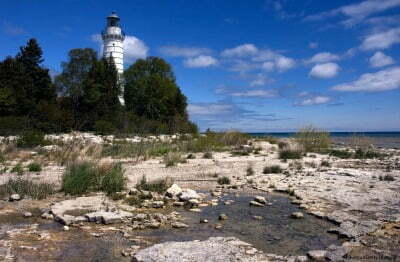 This particular lighthouse is Door County’s most iconic and photographed lighthouse, and for good reason! Since 1868, it has inspired onlookers with its majestic beauty and stunning views from the tower. Whether your are interested in history or searching for a unique Door County experience, a visit to the Cana Island Lighthouse is a must for your itinerary! Cana Island Lighthouse is just one of the many attractions you’ll discover on the peninsula! Download your free copy of our Door County Vacation Guide for even more fun things to do during your getaway! Many more lighthouse keepers came and went throughout the years, each leaving with very negative feelings towards the island. The deteriorating lighthouse was also a major drawback. During WWII, the lighthouse was used as training facilities for the Coast Guard. Many years later, the lighthouse was finally given to the Door County Maritime Museum under caretakers Louis and Rose Janda. They patiently restored the lighthouse, the dwelling, and the grounds while welcoming visitors to the island. The Jandas officially left the island in 1995, but the museum continues to care for the lighthouse and its grounds. Today, visitors from all over travel to the island that endured so many years of hardships and service to catch a glimpse of the beautiful lighthouse that still stands tall. For a more extensive history, visit the Lighthouse Friends website now! You’re invited to travel back in time and take a look into one of Door County’s oldest attractions. After walking across the dry lake bottom, you’ll be free to explore the 8.7-acre island. The island’s main features include the 89-foot tall tower, the original keeper’s home, and the oil house where fuel for the light was stored. However, you’ll also see a brick privy, wooden barn, the foundations of a boathouse, and a stone wall built by one of the keepers. A favorite for many visitors is the ascent up the 97 steps of the tower’s spiral staircase towards the gallery deck. As you climb, just imagine the lighthouse keeper trudging up and down the same steps each night with a large lard to keep the light burning! Once at the top, you’ll be greeted with sweeping views of Lake Michigan and the Door County Peninsula. The sight is sure to steal your breath away and become one of the highlights of your Door County vacation. Cana Island is open from May to October seven days a week. You’ll be able to visit anytime between 10 a.m. and 5 p.m., with the final tower climb starting at 4:30 p.m. each day. For more tickets and information, visit the Door County Maritime Museum Hours and Admission Page! The Door County Lighthouse Festival is an annual celebration that explores the stories behind some of the peninsula’s most famous lighthouses. Patrons will be escorted by land and sea to all of Door County’s lighthouses, including the popular Eagle Bluff Lighthouse and the Old Bailey’s Harbor Lighthouse. Be sure to get your tickets today for one of this summer’s most highly anticipated Door County events! What Will You Find at the Alexander Noble House?